“Minor” cooling system troubles are usually symptoms of a more serious, emergent problem. For instance, you might notice the AC system starting and stopping more often, although this isn’t causing any apparent loss in cooling (so you think you can wait). This process is called short-cycling and can indicate a number of potential issues. It may be something as small as a clogged air filter (which you should change out or clean before using your forced air heating system) or it can be more serious, like the refrigerant leak we mentioned above. Any repair issues your AC system has will worsen and spread over time. This is true for any complex piece of equipment. Returning to the above example, even if the problem behind the short-cycling is minor, the strain put on your air conditioning system due to the problem will create multiple other problems, like a burnt out motor. 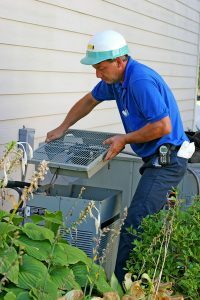 When your air conditioning system isn’t working at its best due to a malfunction of some kind, it will be forced to work harder than it should have to. As a result, it will drain more power. You’ll find yourself paying more to run the system than you should so long as it continues to run with an unrepaired problem. The longer your cooling system goes without necessary repairs, the higher the chance of facing a premature system breakdown. We’re assuming you’d rather not replace your air conditioner years earlier than you planned—this is the most expensive “repair” need you can face, and you don’t even need to! You’re putting off a repair to a less convenient time. Let’s say you put it off until next spring—but then you risk running into hot weather before you have the repair done, and HVAC technicians are out on service calls, causing you to wait even longer for your repair appointment.